Definition: Rotavirus is a contagious virus that can cause gastroenteritis (inflammation of the stomach and intestines). It is a type of infection that’s most common in children under the age of 5. It’s highly contagious and easily transmittable. While it occurs most often in young children, adults can also get the infection, although it’s usually less severe. 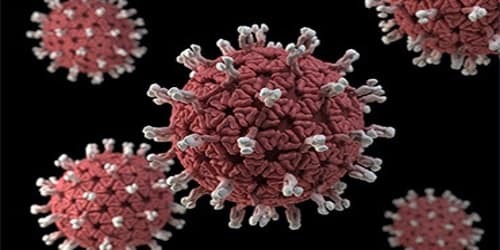 Rotavirus is a genus of double-stranded RNA viruses in the family Reoviridae. There are nine species of this virus, referred to as A, B, C, D, E, F, G, H and I. Rotavirus A, the most common species, causes more than 90% of rotavirus infections in humans. Symptoms include severe watery diarrhea, vomiting, fever, and abdominal pain. Infants and young children are most likely to get rotavirus disease. They can become severely dehydrated and need to be hospitalized and can even die. Although rotavirus infections are unpleasant, people can usually treat this infection at home with extra fluids to prevent dehydration. Occasionally, severe dehydration requires intravenous fluids in the hospital. Dehydration is a serious complication of rotavirus and a major cause of childhood deaths in developing countries. While there are medications to help with the symptoms, there is no medicine that can cure rotavirus. Even children who have been vaccinated against rotavirus may still get it more than once. 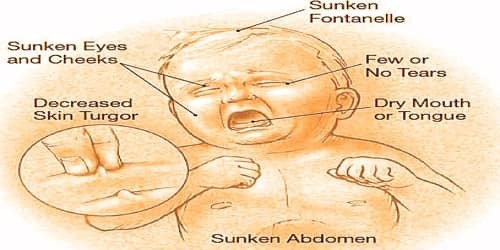 Causes, Signs, and Symptoms of Rotavirus: Rotavirus is present in an infected person’s stool several days before symptoms appear and for up to 10 days after symptoms subside. The virus spreads easily through hand-to-mouth contact throughout this time — even if the infected person doesn’t have symptoms. If people touch a person or object carrying the virus and then touch their mouth, they could develop the infection. This is most common from not washing their hands after using the toilet or changing diapers. Infants and children under 3 are at the highest risk for rotavirus infection. Being in daycare also raises their risk. People might consider taking extra precautions during winter and spring months, as more infections occur this time of year. The virus can remain infectious on surfaces for weeks or longer if the area isn’t disinfected. Rotaviruses are stable in the environment and have been found in estuary samples at levels up to 1–5 infectious particles per US gallon, the viruses survive between 9 and 19 days. Sanitary measures adequate for eliminating bacteria and parasites seem to be ineffective in control of rotavirus, as the incidence of rotavirus infection in countries with high and low health standards is similar. The most severe symptoms tend to occur in children six months to two years of age, the elderly, and those with immunodeficiency. 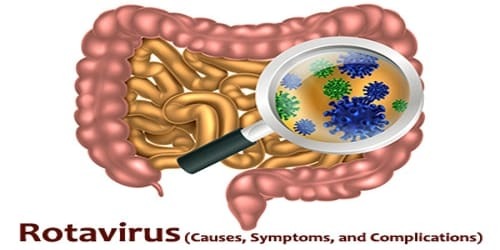 Due to immunity acquired in childhood, most adults are not susceptible to rotavirus; gastroenteritis in adults usually has a cause other than rotavirus, but asymptomatic infections in adults may maintain the transmission of infection in the community. Complications and Risk Factor: Severe diarrhea can lead to dehydration, particularly in young children. Left untreated, dehydration can become a life-threatening condition regardless of its cause. The vomiting, which is a characteristic of rotaviral enteritis, is caused by the virus infecting the enterochromaffin cells on the lining of the digestive tract. The infection stimulates the production of 5′ hydroxytryptamine (serotonin). This activates vagal afferent nerves, which in turn activates the cells of the brain stem that control the vomiting reflex. Rotavirus infections are common in children ages 3 to 35 months — particularly those who spend time in child care settings. Older adults and adults caring for young children have an increased risk of infection as well.